Do you want the ultimate upgrade for your BMW F32, F33 or F36 4 series? 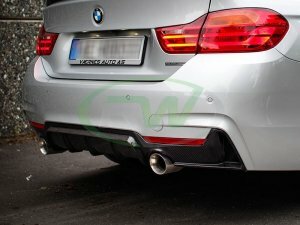 RW Carbon carries just the product with our BMW Performance Style Carbon Fiber Rear Diffuser. These diffusers are made out of real carbon fiber and are based off the performance diffuser that BMW makes, but it a fraction of the price. Each one is covered in a high quality and brilliant clear coat for a beautiful shine and the best protection against cracking and fading. Every 4 series M Sport performance style diffuser is quality checked before it leaves our facility to ensure you get a product free of defects. Get in touch with one of our carbon fiber specialists today and pick up a BMW 4 Series carbon fiber performance diffuser today from RW Carbon.